The news out of Mexico is hardly reassuring. More than 8,ooo murders in 2008. 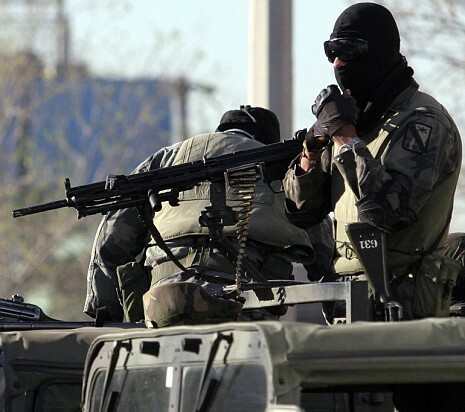 40,000 soldiers deployed across the country to do battle with drug cartels. Unprecedented violence in border towns. Endemic corruption at all levels. Kidnappings on the rise. Tourists are not said to be targeted, but nevertheless Americans are staying away. Visitor numbers to border zones are down by up to 90%. You'll understand, then, that it was with some trepidation that we trundled across the border and headed south. Like most people over 40, our quest for adventure has been tempered by a pragmatic desire to live to retirement age. We may have biked through Beirut and Brazzaville, but we haven't lost our healthy respect for men with machine guns. These guys with guns weren't waiting for us at the border, but it didn't take much pedaling before we crossed paths with heavily armed masked men in camouflage fatigues. Now, I've always associated masks with bandits. And masked men peering down at me through the sights of their automatic weapons make me nervous. What had we stumbled upon? Were we on the verge of being murdered? Perhaps robbed? Or more optimistically , maybe just kidnapped. Nothing so dramatic. We'd merely sidled up to a standard Mexican military checkpoint. Perhaps the masks were just extra protection from the unusually frigid weather. The morning papers had proclaimed the coldest temperatures on record since 1902. Cars were covered in a thin layer of frost and my breath was clearly visible in the early morning chill. Despite being armed to the hilt, the soldiers were friendly. Still they insisted on searching our bags. Looking for weapons, I imagine. There's a brisk cross-border trade and those leaving the US are warned that it is illegal to bring guns into Mexico. As the soldiers rummaged and rifled through the panniers I kept a running commentary of the contents. Aqui hay ropa. Agui hay comida. Aqui hay jamon. Here are the clothes. Here is the food. Here is the ham. My soldier raised an eyebrow when I mentioned the ham, but he kept searching. Finally the men were satisfied that there were no weapons tucked into the tent and we were released. As we made a slow get away on the bikes, me imagining what it would feel like to get a bullet in the back, Eric hissed, "Why'd you tell him you had a ham in the bag?" The word for soap is jabon, silly." My Spanish is definitely rusty. Traveling in the developing world has clear advantages. Many of them monetary. In Mexico we can splurge on the occasional hotel. We can afford piping hot pastries from the corner bakery. We can even manage to dine in simple restaurants without breaking the budget. Six months in the US on a steady diet of bagels (average rate of consumption, about 75 per week), 2-pound containers of industrial potato salad and 25 cent macaroni and cheese dinners and we were ready to take on tacos and tamales. We've just spent two hours caught in a downpour, fighting our way through the snarled traffic of Nuevo Laredo. The streets are flooded, and, this being a major transport artery to the US, semi trucks constantly grind past. There's no avoiding a good soaking. On the outskirts of town we dive into a local truck stop, in need of a reprieve from the weather. The diner is a simple affair, built of concrete blocks and sporting a tin roof on which the heavy rain thunders down. Metal bars adorn the roughly cut windows. I plop down onto one of the plastic molded chairs and take a look around. The place is packed with truck drivers and workers from Pemex in identical bright red uniforms. They are stabbing at heaping plates of huevos and frijoles and sipping steaming cups of coffee. Eric wanders back to the kitchen to chat with the cook and see what's on the menu. I am left alone, but not for long. A heavy set man in a jogging suit topped by a heavy winter parka saunters over to visit. He saw us arrive on our heavily-laden bicycles and wants to know more. The usual conversation about our tour ensues. Where we are from, where we are going, when we will arrive. He is impressed, wants to know when we'll be on television. I chuckle. That kind of fame is reserved for cycling media stars like Mark Beaumont. The man insists on snapping a few photos. Reluctantly, I return to the rain to pose in front of the bicycles. Then Eric joins us and we all pose together, arm in arm, dripping wet with the truck driver beaming in the center. We dash back inside to the relative warmth of the restaurant and there are stacks of hot cakes waiting for us. I smother the pancakes in maple syrup and real butter and then set about fixing my coffee. For although Mexico grows it's own high quality beans, these are mostly for export. When locals drink coffee, it's Inevitably of the instant Nescafe variety. As I stir two spoonfuls of instant granules into a cup of boiling water, Eric gestures to the pancakes and whispers, "Where did these come from?" I glance at the truck driver seated at the adjoining table. He flashes me a wide grin, "Bon Provecho." Enjoy your meal. Mexico isn't particularly known for it's culture of hospitality. Not like, say the Arabs for instance. But over the weeks we have been astounded by many simple acts of kindness. Restaurant owners have refused payment. Fellow diners have picked up our tab. A hotel manager offered us free accommodation. A woman presented us with a two kilo stack of tortillas. Children handed us juicy mandarins as we passed their tiny pueblo. The generosity of the Mexican people is touching, albeit baffling. What drives them to be so nice to strangers? but what about the biking? So you're probably wanting to hear all about the stunning landscapes and archaeological sites Mexico is so famous for. Maybe you thought this update would be full of talk about the sun, sand and sea that drives flocks of northerners to Mexico's coastal resorts. All the great riding along the back roads of Mexico. Well, I'm sure all that exists. We just haven't found it. While we haven't spent the night beach side at one of Mexico's luxurious 5-star resorts, we did pass an evening at the Posada des Migrantes. Not as comfortable as the Hilton, but far more interesting. Thousands of economic immigrants from poor Central American countries pass through Mexico each year on their way to the USA. The international press has reported widely on the hardships these people endure. Risk of death by dehydration during desert crossings. Violence and aggression at the hands of unscrupulous 'coyotes.' Heavy handed treatment by police and military. Asking around for a place to stay in the town of Acayucan, we are directed to the Catholic church. Brother Jesus greets us on the steps of the brightly colored sanctuary and leads us to his living quarters. His wife Rosa-Maria serves us strong Mexican coffee flavored with cinnamon and we sit around the kitchen table and chat. We are at a hostel for migrants--men and women heading north in search of a better life in America. Jesus and Rosa assure us that we are their first guests heading south. The couple has been providing free lodging to migrants for the last 10 years. "Perhaps 500 people are hosted each year," Rosa-Maria explains. "Before mostly men. But lately women too. Some with children, babies even. Even pregnant women are making the trip north." The authorities are fully aware of the hostel's existence and know that many of its guests are in Mexico illegally. Jesus tells me that people in countries such as Honduras and El Salvador are becoming more desperate as remittances from the US dry up. They know it will be hard to find work in America, but still they take their chances. Later a representative of the Mexican migration authority turns up. He is not there to round up illegals, rather he too is there to help. Migrants are provided with a care pack containing re-hydration salts, a bottle of purified water, a can of tuna, some saltine crackers and a pamphlet chock-full of useful survival tips. As hostel guests, we too receive a packet. Although my Spanish is poor, the vivid illustrations in the booklet help me along with my comprehension. I learn that it is unwise to travel in unventilated trucks, I risk asphyxiation. I should stick with my compañeros at all times. If I am lost in the desert, my best chance of being found is to ignite a smoky fire. If I am apprehended by Mexican or American authorities, I should not attempt to flee. The migrants we meet display none of the nervousness or anxiety that one would expect to see in someone who is undertaking such a dangerous journey. They chat, they tell jokes, the disappear outside for a quick smoke. Their composure amazes and humbles me. A bike tour around the world--just for the adventure of it--strikes me as embarrassingly frivolous in comparison. Ah, the vagaries of birthplace. That someone from the rich world can travel freely through most parts of the world just for the heck of it. That those from the poor world must resort to jumping trains and snaking their way on foot through inhospitable deserts just to reach economic opportunities. Eric and I were both lucky in the birthplace lottery, so here we are gallivanting around the world. Someone who wasn't so lucky in the lottery is Francine. She's a young woman from Burundi whom we met while in Africa. Burundi is still a mess after its long-running civil war and Francine has made her way to Zambia in hopes of a better life. Her family back in Burundi is counting on her to send remittances so that her younger siblings can be educated. It's an age old story in Africa. As often is the case in Africa, Francine has run into hard times. The global economic downturn has hit Africa too. Recently, Francine contacted us and asked for help. Financial help. of course she'd not the first. Lot's of people we've met over the years ask us to send money. But Francine impressed me as someone who's sincere and motivated. She's surviving by doing piece work as a seamstress and wants money so that she can buy her own machine and set up business. With all the aid agencies out there you'd think she'd find one that could help her. She can't. Probably in part because she's a refugee from Burundi living in Zambia without the proper documents. If you feel moved to help Francine (as for some reason I did to include her story in this update) please contact me and I'll let you know how you can contact her. She's a very deserving young woman. You've probably picked up on the fact that our enthusiasm for cycling is on the wane. Time for an extended break. Our plan is to whiz through the rest of Mexico, head on into Belize and then chill out in Guatemala until that old urge to hop on the bikes and explore the world returns. Maybe it won't return, and that's okay too. What's important is living life to the fullest, without regrets. If that means another lifestyle re-design, so be it. In what ways would you like to redesign your life? Any motivational tips? Any thoughts on why strangers are so kind to foreign cyclists? Please share your ideas in the comments section. And don't forget to check out the books below.